The grasses offered at the Nursery are those that I know perform well here in the north of Scotland. Grasses add form and movement in the garden and many will extend the season, providing interest throughout the winter months. Grasses are particularly valuable in windy sites and indispensable in mixed border designs. They are tolerant of most soil conditions. Many grasses are available by mail order, shown by *, and are offered in 9cm pots at £3.00 per pot. Usually available from May. Strong growing grass with abundant arching flower stems from mid summer, silver, turning tawny as they age. Height and spread to 1 m.
Good evergreen plant with shiny dark green leaves developing strong rich red and gold tints. In cold winters foliage will bleach. Cut back hard when this occurs. Flowerheads light and carried above main leaf clump (may self seed). Happiest in sun and sheltered site. Height 60 cm. Spread 1m. Narrow evergreen clump of blue-green leaves from which are produced open panicles of golden locket-shaped spikelets on long stalks. These catch the wind and are good for flower arrangements. Height to 60 cm. Spread 30 cm. Strong vertical grass. Semi-evergreen foliage eclipsed by abundant narrow flowerheads which, when dry, stand throughout the winter months. Height to 1.2m. A finely variegated form of the above. Blue-green tidy foliage and decorative black, cylindrical, drooping flowerheads. Height 25cm, slowly spreading. Good for stabilizing banks. A mophead of a grass with long narrow leaves which curl as they grow and age. Good in upright containers or overhanging water or walls. Height 40 cm. Spread to 75 cm. A neat smooth green, tinged russet, grass with ornamental black seedheads. Height to 30cm. Evergreen variegated sedge. Broad creamy white stripe down midrib. Makes compact mound. Height to 15cm. Strong evergreen clumps of broad foliage and decorative pendulous flower heads. Best for wet ground and pond margins. Height to 1m, spreading. Evergreen mophead developing a rich orange colour when grown in full sun. Has brown flower spikes. Height and spread 50cm. Dense neat clumps of arching slender leaves over which are held fluffy cloud-like panicles. Height and spread to 1m. A striking blue leaved grass happiest in well drained soil and sun. Height 80cm. Height to 60cm. An excellent, intense blue, fescue. 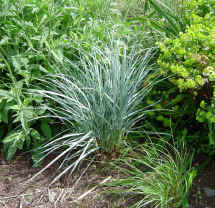 Dense wiry evergreen clumps of blue foliage, with light upright open flower heads appearing in late spring and maturing pale tan. Best colour develops in full sun and poor dry soil. Height and spread 30cm. Deciduous grass. Drooping deep green leaves turn shades of orange and red in autumn. Cut back as new leaves emerge. Height 30cm, spread 40cm. Annual ornamental grass with soft fluffy flowerheads, suitable for drying. Variegated melic bearing delicate, narrow flowerheads in spring. Height to 40cm, slowly spreading. A soft yellow grass to brighten any partially shaded area. Best cut down in early spring. Height to 60cm, spread 40cm. Strong, spreading miscanthus, requiring full sun and damp soil. This far north its robust nature is somewhat tempered, but can reach impressive heights in a good summer. Height to 2m plus. Spreading. Early to flower with lovely fluffy, pink-tinged plumes. Slender foliage. Height to1m. A fountain of graceful narrow foliage, best placed to give it room to show itself off! Can flower in warm summers and sheltered sites. Height 1.2 - 1.5m. Strong miscanthus with striking silver flowerheads. Height to 1.75m. Tall with long broad ribbon-like foliage held aloft on strong stems. Striking throughout winter. Height 1.2m plus. Strong upright stems with arching foliage striped with cream bands. Needs sun to develop good banding. Height 1.2m. Narrow glossy dark green leaves form dense clumps from which tawny flower heads rise to be held high above the foliage. Height to 1.5m. Steadily clumps up. Slim clump forming grass with light airy panicles on strong stems. Height to 1.6m. Light green foliage from which rise numerous stems holding large open heads of dancing spikelets, these catch the wind and shimmer throughout the summer. Flowerheads break off in early winter. Height 1.5 - 1.75m. Fast growing annual grass with open, airy flower panicles. Good container grass for shimmering effect. To 80cm. Spring flowering grass with evergreen leaves, silvery beneath, which makes a compact mound. Metallic purple flowering spikes held high above the foliage. Height and spread 30cm. Attractive evergreen grass, with long smooth grey-green leaves forming sturdy clumps. Flowers are held high above the foliage in spring. Height to 60 cm. Very ornamental upright grass producing long featherlike awns which release a sharp seed. Does not tolerate competition. Height and spread 75 cm. Dense clumps of erect grey-green foliage with many silvery flowerheads held stiffly above the leaves. Height and spread 60 cm. Spectacular specimen plant. A clump of dense evergreen narrow leaves give rise to numerous long strong stems bearing large golden spikelets which catch the sun and wind. These last into autumn. Height to 2.2 m. Spread 1m plus. A taller form of Stipa tenuissima, plenty of billowing feathery seed heads. To 1 m.
Tight clumps of needle thin foliage and flowerheads comprised of long feathery awns streaming out. Place in an open position to appreciate it at its best. Height to 80cm, spread 40cm. A true evergreen needlegrass. Fine bright green leaves form an arching clump from which feathery plumes are produced in abundance. The whole plant responds to the slightest breeze. Elegant and very tempting to touch. Good in containers. Height and spread to 60 cm. Low clump-forming grass with rich mahogany coloured foliage. Abundant seedheads produced, and will seed where happy. Does best in sun. Height and spread to 30cm.